Interesting. 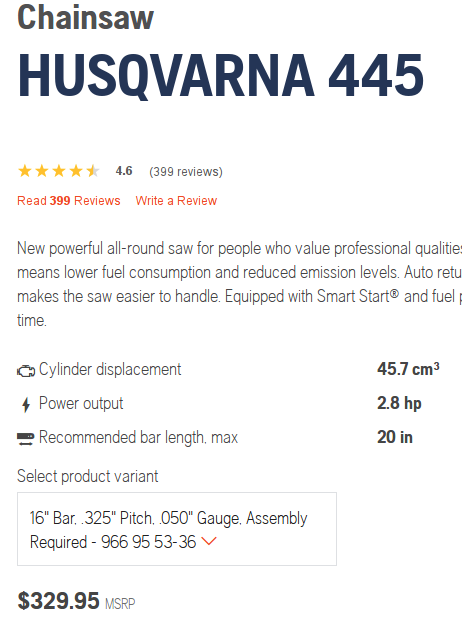 Now, almost two years later, I had to check the prices here in Sweden, where the Husqvarna brand has its roots. According to their swedish site, the MSRP is 6000 SEK which is roughly 970 NZD. Not too far from what they charge you. But… If i looked at the actual store prices, most of them had flattened out at 3900 SEK (~630 NZD). So my conclusion is that Americans, with their cut-throat economy, are accustomed to MSRPs being actual store prices, while the rest of us are supposedly morons, who feel they have made a real bargain when buying an article at 2/3 of the MSRP. Even though there are no stores offering it at the MSRP levels. I have given up on Husqvarna and bought a comparable Shindaiwa for 2/3rds of the price. The thing that sold me wasn’t actually the price, what sold me is that Shindaiwa is actually made in Japan, while the Husqvarna was looking at is made in China. 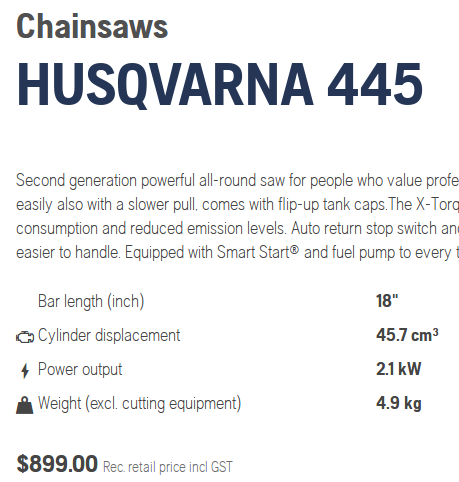 I could not find any reasonably priced Husqvarna chainsaw anyway, it seems that local distributors are stuck up and never answered my queries. 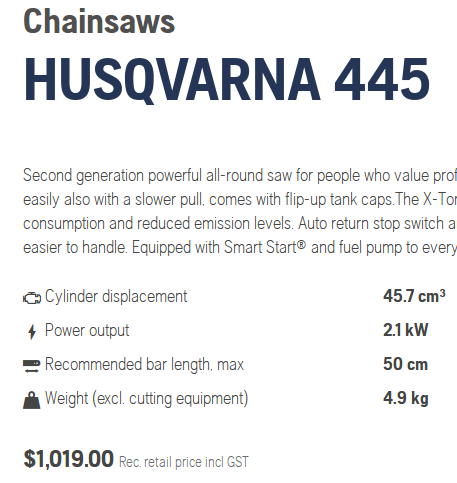 If you are looking at entry level but not junk chainsaw Shindaiwa or Echo is the best bet (both have same parent company and made in Japan), rest of sub $1000 saws will be made in China.